regardless of trail conditions or weather events. Whatever best hiking gear or outdoor clothing being reviewed is without a doubt the most durable, and features the cleverest design known to humankind. How can you live one more moment of your life without the best hiking gear?? Always ask yourself: Is it realistic to expect any/all of these great features from this particular piece of clothing or device? Follow up question: Is it realistic in the conditions I'm going to be using it? Go to trusted sources of information, and even then, hold a bit of scepticism for big ticket items such as backpacking tents, sleeping bags, boots, and durable hiking clothing. "Prove it!" should be the attitude you adopt while reading gear reviews. For example, if you're curious about backpacking gear reviews, check out this example. Note how it's balanced: the good right along with the bad. That's why they've earned a place in my "trusted" category for hiking gear reviews. Also be prepared to cross-check the information from multiple sources, if you are seriously considering this backpacking gear as an addition to your gear list. Don't fall for the first piece of marketing you read in that glossy hiking magazine! There are rooms full of marketers plotting ways to entice you into trying on, or trying out, their outdoor gear and clothing. Nothing wrong with that, but go into the gear arena with eyes wide open. Assuming you've already visited Gear Junkie mentioned above, here's a second source of credible reviews: Backpack Gear Test. Who knows? You might even end up being a reviewer for them! I'll mention one more good place to cross check your information prior to purchasing backpacking gear, written from a non-American perspective just to balance things out. Plus, I love their name: "Live For The Outdoors". That's my motto, for sure! These folks provide lots of interesting background information about backpacking gear, too. Try their info on backpacking tents, for instance. Spend some time on this site, but remember to cross check the info elsewhere before you rely upon the gear on your next trip into the wild unknown. Big views need trustworthy gear! Choose your backpacking gear reviews, and gear, carefully. I replace worn out gear every season, just as you probably do. And I love to try a new concept, or a new twist on a favorite brand. In the spirit of sharing with my virtual trail buddies, I've got some gear reviews for you, too. My opinion and endorsement cannot be bought, because I'm not in the business of pushing gear on you. My reviews are factual and thorough. 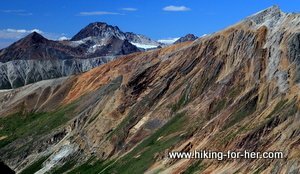 Be confident that I am on the prowl for the very best backpacking gear reviews, and that I will share them with you! And I would love to answer any questions you have about any of the gear that I review. Use that handy little blue box below to contact me. Now it's your turn to share outdoor gear knowledge. If you use a great source for quality, unbiased gear reviews, please send it my way, and I'll share the wealth right here on this page. P.S. It doesn't have to be backpacking gear - any hiking & camping gear review sources are welcome here.